Why SafeWay Driving for Business? 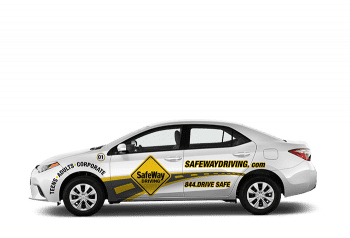 SafeWay Driving improves employee safety and lowers company risks by delivering the very best professional defensive driving classes and behind the wheel training available. The SafeWay Driving System® is a proprietary driver training system that offers you and your organization the peace of mind that comes from providing your people the ultimate in driver safety training while giving your company the risk mitigation protection it requires. From Driver Assessments to Driving Safety Courses to Relocation services, SafeWay Driving partners with organizations of all sizes to improve team driving performance. Select from our variety of popular packages or let us customize one to fit your demands. Can you provide customized services to fit our organization’s needs? Yes. While most companies find what they need in one of our four categories of corporate driver training packages, we stand ready to take care of your organizationʼs unique driver assessment and training needs from 5 to 5000. Can you train large groups? Yes. SafeWay’s team of professional driving instructors has trained groups of all sizes in many different settings. Let us know what your special need may be and we will design a program to achieve your objectives. Can we pay with a corporate credit card? Yes. As a matter of fact, we prefer the corporate credit card be entered online to pre-pay for your team members’ training services. We will issue them a unique credit code they will enter and take care of their training. This will simplify processing and expedite the booking of your training services. Credit cards MUST be used for all single purchases smaller than 10 employees. Can we authorize with a Purchase Order and pay by check? Yes, but only for single purchases larger than 10 employees. Groups smaller than 10 or individual bookings must be paid in advance with a credit card. Can you train in our special vehicles instead of your driver training cars? Yes. If you feel it will help your team members to train in your vehicles instead of our specially equipped training cars, we will do so. There is no difference in cost regardless of the program you select for your team. Where do we start? Can you make a recommendation? Absolutely. Tell us what your needs are and we will make a recommendation to achieve your goals. For most, that means beginning with a Corporate Driver Assessment of every driver on your team. We can provide you an immediate electronic document of the results for their employee files and make recommendations on continued training based on the findings. The Corporate Driver Assessment also provides you a benchmark for future improvement and advancement of each driver. What if we only have one employee driver? Will you train them? Yes. To many small businesses, that one driver is just as important as the 100 drivers from a larger company. They are all lives on the road and we will take great care in training every single one. Can we pre-pay for our group? It is recommended you pre-pay online with a credit card and we will issue each employee a unique credit code number to enter our system and book their training. This is especially helpful when you have a large group to train over an extended period of time. How long is our group training package valid? Your group training package expires in one year from the date of purchase. If you buy in bulk to simplify your purchase and save from the group discount, make sure you use your training within one year of the date of purchase. It expires at that point and the balance is reset to zero with no credit available.